Cork, 2 May 2017: Entries to a video competition to promote online safety, What’s Your Story, have overwhelmingly demonstrated that the Irish youth understand the need for balance in their digital lives. With a record number of entries this year to Trend Micro’s video competition, the winning video “Power Off” was created by students from Coláiste Muire Cobh and Cobh Community College in County Cork. Pictures have been sent to the picture desk by Cathal Noonan. Captions are below and embedded in the images. To view the video winners, click on the links below. 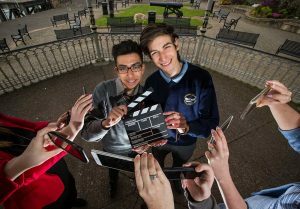 Caption: Mattia Nardon, Cobh Community College and Rithik Makker, Coláiste Muire, Cobh celebrate winning the overall prize in the Trend Micro ‘What’s Your Story’ video competition for their video entitled “Power Off”. The video discussed the importance of balancing social media in young people’s lives, which was along with social media addiction was a recurring theme in this year’s competition.